Last week, I shared notices I have found for Ernest’s marriage to Jane Elizabeth Wilson, and articles about his death. This week, I will share more articles I found for Ernest. The first is where he advertised for information about his wife, as he intended to remarry. Ernest did remarry, to Mary Emma House in 1914 at Fremantle, and the following notice shows that Letters of Administration of his estate were granted to his wife, Mary Emma Meiklejohn. In searching for more articles, I found the following two notices his wife Jane inserted in newspapers in Queensland and Western Australia. This indicates that as late as 1911, Jane was still living in Sydney. It therefore seems more likely that Ernest deserted Jane, rather than Jane leaving Ernest. Is that why, and when, Ernest went to Western Australia? It would appear not, because a daughter Iolene was born in 1896. Did Ernest return to Sydney sometime in 1895? Or was the absconding clerk not the same Ernest? 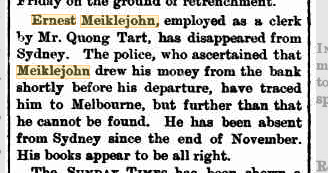 A search of Ancestry located a record for Ernest Meiklejohn in the New South Wales Police Gazette. This Ernest Meiklejohn was 23 years of age – the same age as Ernest Edward Meiklejohn. And a second entry in the New South Wales Police Gazette, was found for Ernest, this time in 1895. Ernest Meiklejohn, charged on warrant with embezzling the sum of £3 7s. 8d., the money of his employer, Quong Tart, has been arrested by Senior-constable Stove, Sydney Police. Discharged – no prosecution. Identical with missing friend, same name, see Police Gazette, 1893, page 405. 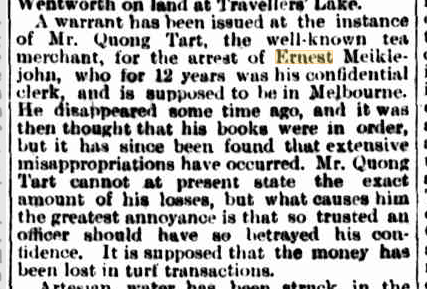 So, Ernest had returned to Sydney by 1895. He therefore moved to Western Australia sometime after Iolene’s birth and death. Tomorrow, I will provide a summary of the information found so far for Ernest, as well as some additional records found for him.